While no one will ever know what happened to the young member of the Rockefeller clan who mysteriously vanished in the Asmat region in 1961, one thing for sure, the Tagbanua people, even decades before aren't feared nor they were intentionally cut from the outside world. As Coron Island starts to get bigger in sight, I feel like an intruder venturing into their world. I told myself, we were not here to document their way of life as if its something of entertainment fodder or a NatGeo feature. What we really set out forth here is to interact with some of the locals, to learn a thing or two. Which a couple of hours later as we board our boat back, we would learn a romantic story, far more touching than most John Cusack, Sandra Bullock and Kim-Gerard movies combined. After wadding through knee deep streams and unto the Tagbanua's quiet community, we reached a house painted in colored blue like it appeared out of nowhere amidst the green surroundings. Lauren describes it as a "Mexican Mariachi House" We saw an elderly couple who introduced their names as Salong and Salome. Salong is the brother of Rodolfo Aguilar I - the current tribal leader of the Tagbanua tribe. 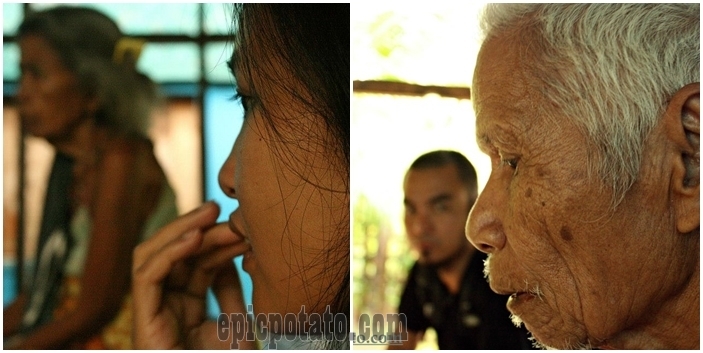 Mang Salong's feature is highlighted by the deep lines on his face and one will quickly notice the cataract on his eyes. To the casual observer, he would seem weak and old, but the moment he started talking one would notice right away that old age hasn't slowed down his spirit and mind even one bit. We noticed a tattoo on Nanay Salome's shoulder and asked when she had that. She told us, it was Mang Salong who inked her as a sign of their love for each other, many years ago. The story goes, they met many years after the war and were united together through a fix marriage. Through the years they had four children, whom unfortunately all died at a young age due to malaria. I could only shake my head upon hearing that, as the tragedies that befell them happened more than 20 years ago and it could have been prevented today, now that medical care is available even in the island of Coron, through the periodic visits of health care workers and the new technology advancements on the cure of Malaria. I looked around their house and all I can see are symbols of simplicity. I feel a little bit of out of place by parading around their community with a DSLR camera hanging around my neck. It certainly feels like outsiders like us are infecting their simple lifestyle with unwarranted hinges to the modern world. Mang Salong also told us about a minor conflict that is going on between factions of their tribe. Since the Tagbanwa tribe of Coron Island were awarded jurisdiction and management of more than 22,000 hectares of land - as accorded by the Ancestral Domain law in 1998, misunderstandings grew at how each places would be managed, specifically the popular tourists spots like the Kayangan Lake, Banol Beach, Siete Pecados to name a few. While I believe that they deserve to claim property of their land. Again, I feel like the whole source of this mess or problem, is us - the outsiders who frolic at their land like tourists, posing for photographs and merely treating it as a holiday destination. Not knowing that it is a sacred place for the Tagbanua people, and them opening this place to us, problems within them arose as its after-effect. On the other side, the fees collected on tourist spots scattered around Coron can become really useful to their community. I hope certain individuals, whether a member of their tribe or from the local government - or even some LGU units can help them resolve their differences, so the funds will be equally distributed among the members of their community. Health care - to avoid further deaths due to diseases like Malaria, a water system that will provide clean drinking water, as the community still relies on rain water for their daily use. All of these problems needs quick attention of the local and provincial Government of Palawan. Our visit was really an eye-opener. That 'tourism' and the income it generates can't be solely taken at face value. Each one of us should also start to equate it with the communities who were already living and thriving in their own simple ways. It may look Jurassic to us outsiders, but take away our material convenience and put ourselves in their situations? then ask yourself if you'd survive a month, a year or a lifetime. We know that we cannot. We had the ability to help them through little jobs and income the tourism part will generate, but it is paramount that we respect their way of living, culture and traditions. As we bid Salong and Salome goodbye, I looked back at their simple life and look forward to going back to my own. Walking back towards our boat we encounter other residents of the island. Our guide Russell introduced us to his mother who also resides at the island but is not of a Tagbanua origin. Much like the communities all over Busuanga and Coron, outsiders have been welcomed as part of their own - making both non and full pledged Tagbanuas living together in harmony. We also met the barangay leaders, who politely rejected our request for a chat. Knowing now, how the tide of modernity and the tourism industry have somehow stepped on the sacred ground of their place, we understand completely why some of them would not like to talk to us. I just hope that somehow, in the near future, we all find a balance to find ways and means for their community to flourish, without having to sacrifice the sacredness of their land to the outsiders who usually come in hordes aboard a boat with flashing cameras, and a smile of holiday-makers. Ron and Monette reached our boat minutes ahead of us as we all took our precious time walking along the stream, getting our feet wet, looking at the forested path and most of all, we feel like the younger versions of Salong and Salome.